Castles and palaces are a terrific place for the imagination to run wild. 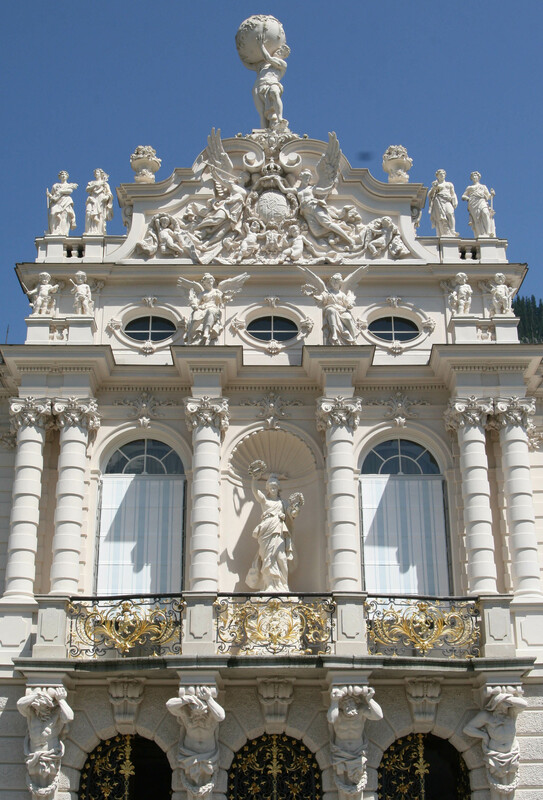 One of the best is Linderhof Palace, built by Ludwig II, King of Bavaria. Near the Ettal Abbey, Bavaria (which is southern Germany, bordering Austria), the gorgeous palace of Linderhof nestles into the German countryside, not far from Berchtesgaden. 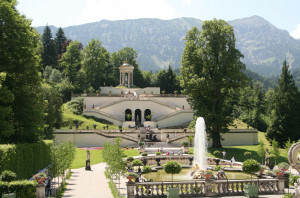 Though Linderhof is the smallest of the three castles or palaces that King Ludwig II built, the king actually lived to see this one completed and lived in it for a time. 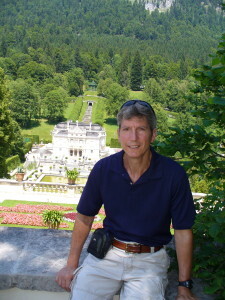 The grounds of the palace appear sumptuous because they are modeled after the Versailles Palace of French Sun-King Louis XIV, whom Ludwig idolized. The palace was built in a location Ludwig knew, because he went on hunting trips with his father, King Maximillian II in this area. The main palace’s biggest room is the ceremonial bedchamber where King Ludwig held the first and last audiences of the day. When we visited this room, we saw exquisite decorations, paintings on walls and ceilings, including large murals, and many artistic touches. 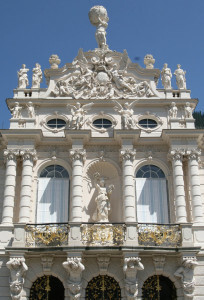 The palace building is more a private dwelling than a place for entertaining and Ludwig liked the nighttime hours for wakefulness, instead of the daytime. The palace grounds are an adventure in themselves. An ornate golden fountain directly in front of the building shoots water over seventy-fifty feet into the sky at regular intervals. Walking straight past the fountain and up the hill, we climbed a beautiful white staircase, past groomed gardens with flowers arranged in carefully laid out designs up to the round Temple of Venus. Looking back to the palace is a breath-taking view! On the palace grounds there are extensive gardens in each compass direction. Several attractions such as the Moroccan House, the Moorish House, the Hunding’s Hut, Gurnemanz Hermitage, plus other statuary, fountains, and plantings make this an explorer’s paradise. One last palace ground feature you’ll want to see is the fascinating grotto, and manmade underground lake representing the First Act of Wagner’s “Tannhäuser.” We saw the golden gilt swan-boat that King Ludwig II rode in himself and saw the changing colors with background lighting installed when the King built the grotto.